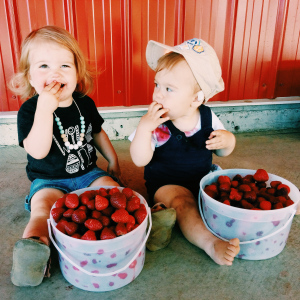 The other day my sister, myself and our babes got together and decided to go strawberry picking for the first time. I have seen a lot of posts and many very delicious looking photos of friends going out to their local berry farms, I wanted to go try it out for myself. As a kid my mom would take me and my sisters berry picking all the time, but it was usually raspberries and blueberries that we picked. 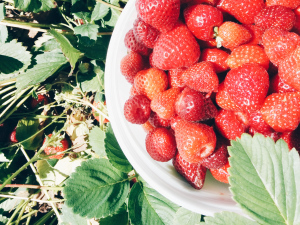 I was excited to try out strawberry picking for the first time, and I have some tips for any of you other first timers out there to ensure you have the best experience. While dropping my son off at school in the morning I was thankful that I shared with another mom about my plans to go to the berry field that day, turns out I really had no idea what I needed to make the day a success. I hope you enjoy my tips, have a laugh at the silly things I did, and enjoy your time in the berry fields this summer. When you get to the berry field check in first as for insurance purposes. (I did not realize this and just walked straight to the field, my sister came later and informed me we were supposed to check in and place a $2 deposit that get’s taken off at the end of picking. I apologized to the lady when paying for my berries that I was unaware of this and she kindly let me know that it is important to do, due to insurance regulations. It was super helpful to have both of our kids there together as my one and a half year old isn’t quite old enough to help and doesn’t stay in one place for too long. With her cousin there they kept each other company for the short time us mom’s picked. We were out in the field for about 30-45 minutes and filled up two ice cream buckets. It really doesn’t take that long and is hugely beneficial if you are big berry eaters at home. I have a bucket full in the fridge and a large ziploc bag full in the freezer now. 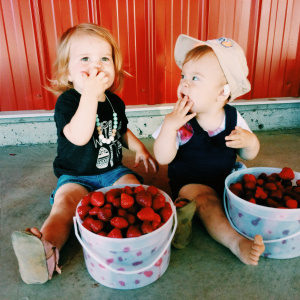 Enjoy and hope your first time berry picking is a blast! We sat down after we payed and took a few shots of our babes enjoyed what their momma’s just picked.